This is an English locational name, found particularly in Northumberland and comes from an unidentified place in northern England, more usually described as a "lost" village. There are many examples of such places that now exist, in surnames or in ancient records. Villages were "cleared" in the 14th Century to make way for sheep pastures and were sometimes left deserted by natural disasters such as the Black Death of 1348 or accidents of war. The placename derives from the Old English pre 7th Century "haesel" (or the Old Norse "hesli") meaning "hazel tree", with "hop", an enclosed valley. There are at least ten alternative spellings of the name in the modern idiom, ranging from "Heslop", "Hislop" and "Hyslop" to "Haselup", "Hazeup" or "Heaslip". 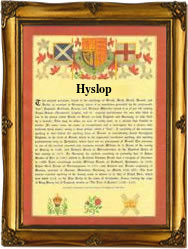 The first recorded spelling of the family name is shown to be that of John Heslop. which was dated 1414, in the Register of the Freemen of the city of York. during the reign of King Henry V, known as the Victor of Agincourt, 1413 - 1422. Surnames became necessary when governments introduced personal taxation. In England this was known as Poll Tax. Throughout the centuries, surnames in every country have continued to "develop" often leading to astonishing variants of the original spelling.